Between August and September, so much has happened around the world. Family and friends have been at the forefront of my mind in the past two months and even still today, so I needed to take a break and ensure that was happening first. If you are able to donate in any capacity to help the American people of Puerto Rico, please visit here for more information that directly goes to the aid desperately needed there. Now that we are into Fall, I want to share this pretty Maggy London black and white midi dress (on sale for under $60!) . You’ve definitely seen me share many Maggy London pieces this past year. Some of your favorites have been this black and white wrap dress, this colorful lace dress, and this beautiful sheer top! I feel in love with the brand because it represents all that I admire in a clothing brand from feminine dresses and tops (and now pants!) to pretty prints. 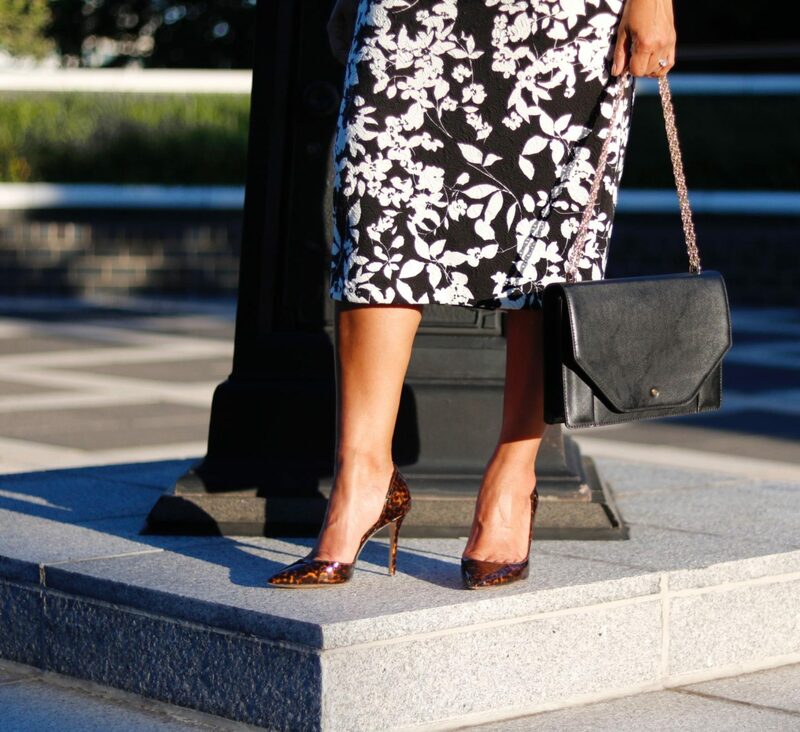 Mixing prints is something I’m enjoying lately, and a good tip is that any leopard or tortoise heel (as shown here) is the perfect way to add to any black and white look, even stripes! And since the Fall is taking it’s sweet time to show up keeping us in warmer temps the last few days, this dress is the perfect transitional piece with a classic black and white twist on florals. One of the best attributes to a Maggy London dress is how fitted it can be on the waist, making for the perfect detailed belt to add to the look. Adding some texture and cutouts for an edgy style while still looking classic to work is a great way to try something new in your wardrobe. So go for it! Such a beautiful dress! It’s fits you so well! Very classy look. What a chic dress! Perfect for day to night! That Maggie London dress is so pretty on you! I love the cut outs. i love maggy london, they have perfect dresses that transition from work to play! Girl you look so stunning! This dress is amazing on you. Your shoes are absolutely amazing!! This dress looks amazing on you and I adore that belt! Such a pretty outfit! Love the print of that dress! This dress is way cute!! Perfect for fall! What a beautiful and classic dress! I love the leopard with the floral!! Love the details you added to the classic black and white dress! Gorgeous! That is such a beautiful dress, and I love it with that belt! Wow you look amazing! what a great dress! This dress is gorgeous and I love the cutout details on the top! That dress fits you perfectly! 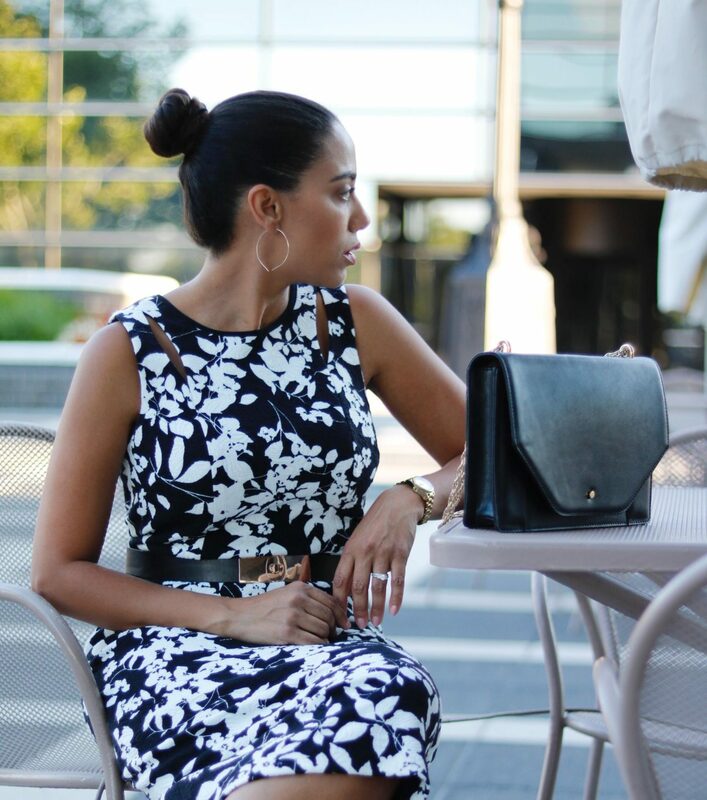 I love a good transitional dress – def needed this time of year. This print is so amazing, I love how you styled it. So chic! This dress is so cute! It would be perfect for work. Nice dress! And I love the popping color of the bag that went really well with it. The dress is gorgeous, I just love it. The shoes are to die for and I’m a big fan of shoes! How I love Miss Maggy! I would never think to pair those shoes with this dress! Looks great! The dress is lovely. A classic which will never go out of date. I’m loving those shoes too. I love the pattern + tortoise shell shoe combo. The fit is so flattering, too!